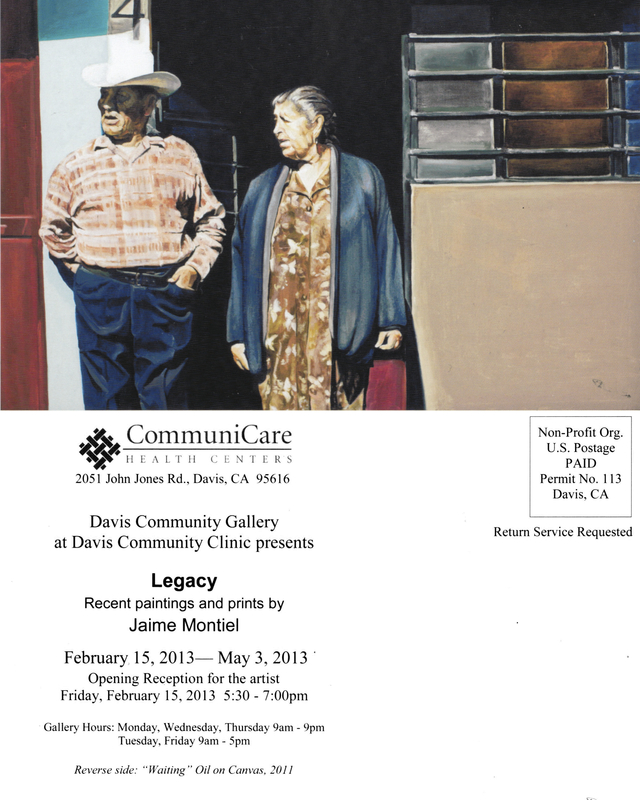 We would like to inform you that TANA Artist in Residence, Jaime Montiel, will be showing his recent paintings and prints at the Davis Community Gallery, from February 15, 2013- May 3, 2013. We invite you to an Opening Reception for TANA Artist in Residence, Jaime Montiel, on February 15, 2013 at the Davis Community Gallery in the Davis Community Clinic, from 5:30- 7:00 pm. Please join us for this special evening to recognize one of our own workers at TANA and his work. Thank you for posting this! We look forward to hosting the opening for Jaime next Friday! CONFIDENTIALITY NOTICE: This electronic message contains information from CommuniCare Health Centers, which is confidential or privileged. The information is intended to be sent to the individual or entity named above. If you are not the intended recipient, be aware that any disclosure, copying or distribution or use of the contents of this information is prohibited. If you have received this electronic transmission in error, please notify us by telephone at (530) 753-3498.